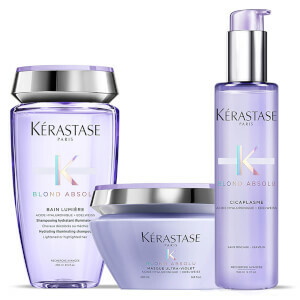 Reveal smoother, shinier locks with Kérastase Blond Absolu Cicaplasme Treatment, an intensive, leave-in hair mask that brightens blonde, highlighted and grey hair. 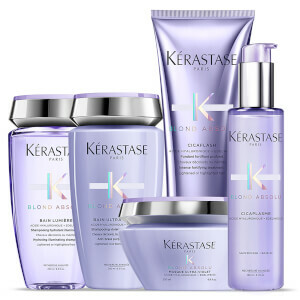 The shimmering, lavender-coloured cream coats each strand in a nourishing veil to smooth the hair cuticle and seal split ends in order to tame frizz and flyaways. Enriched with Hyaluronic Acid and Edelweiss Flower to deliver intense hydration, the rich treatment protects hair from temperatures up to 230°C while defending against damaging UV rays and pollution. 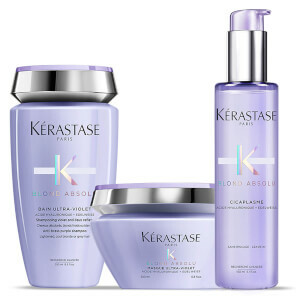 After use, locks feel sleek and supple and are infused with a brilliant shine. On Towel-Dried Hair: Take 2 to 4 pumps, depending on the lengths and thickness of the hair. Spread down to tips, then comb to evenly distribute the product. Proceed to blow-dry or air dry. 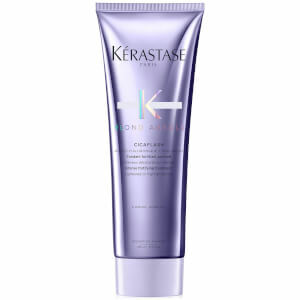 On Dry Hair: Apply to dry hair after blow drying or airdrying as a finishing touch to tame frizz and boost shine. Style as desired.